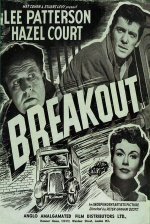 "Breakout" (1959) is a neat and short Britnoir that shows all phases of a prison breakout done from the outside. We see planning, execution, getaway and aftermath. Lee Patterson is hired by William Lucas and Terence Alexander to devise and carry out a plan to spring investment fraudster John Paul from a medium-security prison. Awaiting Paul on the outside is Hazel Court, but she gets involved with bachelor Alexander. Patterson's second occupation keeps his wife Billie Whitelaw in the dark; she wants a TV and Patterson doesn't like debt, so this is his way of getting ready cash. The plan requires getting a man inside. Dermot Kelly is the one, achieving a 30-day sentence by starting a barroom brawl.